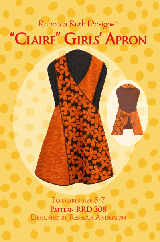 Now aprons for girls too! "Claire's" criss-cross construction suits girls size 5-7. Includes full-size patterns and instructions with illustrations. Companion to "Clara." RRD 308.